By Kori ~ August 27th, 2012. 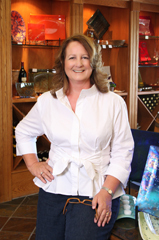 Deborah Barnard and her husband Rob Griffin founded Barnard Griffin Winery, located in Richland, Washington, in the heart of the Tri-Cities, in 1983. They built their winemaking facility on Tulip Lane in Richland in 1996. 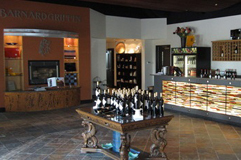 Barnard Griffin has recently completed a winery renovation with a new tasting room and has added a wine bar, private event space, patio, and incorporated a glass studio gallery featuring Deborahâ€™s work into the tasting room. As of August 17th, the Puget Sound Business Journal ranked Barnard Griffin as #9 in the list of Largest Wineries in Washington Ranked by Gallons Sold in 2011. Barnard Griffinâ€™s current annual production is approximately 75,000 cases. Recently, Deborah was kind enough to take time out of her busy schedule to answer some questions for me and our Wine Peeps readers. I moved to Washington State in 1978 to go to graduate school in hospital administration at the University of Washington. I had met Rob Griffin at UC Davis in 1974. We got married in 1980 and I moved to eastern Washington. In 1983, our first year as a winery, we produced 400 cases of Fume Blanc, Chardonnay, and Riesling. The following year we added Merlot and Cabernet Sauvignon to the production list. When we started Barnard Griffin, I was working full time in hospital administration in Spokane and then Toppenish and then Pasco until I retired in 1995. Then Rob and I built our winemaking facility on Tulip Lane in Richland, Washington in 1996. During the initial years, I would drive home from Spokane on Friday, very pregnant with my second daughter Elise, and work with Rob all night bottling or harvesting or whatever else needed to be done. In the very early years, Rob did the paperwork because I had my other full-time job. Now, in addition to my role as co-owner of the winery, I am a fused-glass artist and have my own glass arts studio & gallery in the winery. Plus, I volunteer at and participate in a number of charity efforts. Iâ€™m Vice Chair for the Great West division of the American Cancer Society. I serve on the Endowment Committee of the â€œChaplaincyâ€ which provides hospice care in the Tri-Cities area. Also I volunteer to conduct glass classes for children with the Boys & Girls Club of Benton and Franklin Counties. What were the steps that led to where you are now? It may sound trite, but our focus is on excellence in execution, consistency in branding, and affordability in pricing. Given the amazing breadth and scope of the awards and accolades weâ€™ve garnered with our wines over the years, we could have easily charged so much, much more for our wines, but that was never in our philosophical decision set. Slow and steady growth was and is our Mantra. And with our 30th year anniversary as a winery coming up in 2013, we are one of the top wineries in the state by any measure and this is out of a field of more than 700 Washington State wineries. We started slow and experimented a lot. We learned a lot from our mistakes, tracked them, and cheerfully made any course corrections required. Has being a woman been an advantage or a disadvantage in your wine journey? Well, like everything in this world, it has been a mixed bag. We often stand on the shoulders of those who have gone on before us and I would look to other women pioneers, in wine and other disciplines, for guidance and inspiration when times got tough. And, of course, times were challenging for women in business 30 years ago, more so than now. Since my husband is the winemaker, many duties, some unforeseen and unbidden, by default had been left to me. So, I had to wear many, many hats and become an instant expert in what for me at the time was often new territory. And back then, it was sometimes difficult being taken seriously by the men in the business, and I found I had to work three times as hard to earn their respect. So while a challenge, you learn skills that will help you later on in many different ways. The trick is to consciously learn and hone such skills. Some roles resonated with me, and I jumped to them right away such as the creative side with our classic and now iconic Tulip label design. Others were areas/tasks where I had to learn and learn fast for the good of the winery as well as our family. Also, as a woman, I would fulfill some of the more social roles as my husband Rob was and is required to spend a lot of time making sure that grapes are brought to magnificent fruition in each and every bottle. Of course, getting out and about running a household, raising two daughters, managing duties at the winery, reaching out to the wine community, the Tri-Cities area and the consumer; all while pursuing charity work and my creative passion for fused glass art with my studio and gallery, takes a lot of time and requires much multi-tasking. I think being a woman helps with being a firm-but-fair co-owner of a winery; multi-tasking, delegating and coping with so many everyday challenges. What advice do you have for a woman wanting to get involved in the wine business today? Donâ€™t do it! (Laughs) The classic saying is: â€œOwning a winery is a great way to turn a large fortune into a small one.â€ So you need to go into this business with your eyes wide, wide open. But, if you have the passion for this industry, then follow your bliss! The wine industry offers much in the way of what appeals to a womanâ€™s professional sensibility, suitability as well as capability. Women can and do thrive in this environment, especially as the industry has opened up and will continue to do so for our gender. I would say volunteer for each and every task, no matter how menial and perhaps a little off course for your specific interest or discipline within the industry. This in order that you blossom as a professional firmly rooted in and knowledgeable about all aspects of the wine business; meanwhile, ratcheting in on what specifically floats your boat! There are 8,000 things that can go wrong before a beautiful bottle of wine is created. Go learn what they are and the solutions. Your career in the industry will be richer and more robust for it. What are your thoughts about the Washington wine industry, in general? Itâ€™s growing and evolving so fast. Of course, market forces are having their way with the industry with a slower than anticipated recovery, the whim of weather conditions, and I-1183 changing the rules and the way of doing business in the state. We just have to continue to be smart, nimble, responsive, and consistent with a great work ethic to slug it out every day. Plus, there are the oh-so-rapid changes in social media and the rest of the digital space in terms of how we communicate, converse, and interact with consumers, distributors, and our retail customers. Then there is the quality of the wine in this state. The quality of our wines is undisputed. As a percentage of total production, Washington has more 90+ point Wine Spectator scored wines than any other wine region on Earth. And, our winery is of course proud to have made quite a few contributions to that statistic. The trend yes, the rate, maybe not so much.Â But, we should come out of the overall economic trough in even better shape. Our industry will be stronger for the testing. And, as weâ€™ve seen, the wine industry has been a bit more resilient than other industries through these very difficult times. In the midst of it all, I expect that the number of women that become involved in the wine business to blossom and grow. How do you and your husband, Rob, divide the duties at the winery? Rob makes the wine, and I have to do everything else! (Laughs) Actually, until our daughters entered the business, we would divide the duties according to our different strengths. Rob would grow and purchase grapes and handle the physical plant needs such as supplies and equipment. Now, we continue to share in and collaborate on a lot of duties including accounting/fiscal planning. In addition, a lot of my focus is on strategic planning, looking at the crystal ball on the business planning side. As winemaker and co-owner, Rob contemplates the crystal ball on the production side including all the elements that this entails including planning harvest, grower relations, and being out in the vineyards. Now that we have a great and expanded support staff, I can spend more time away from my co-owner and senior director role on supervisory duties to devote to my glass studio & gallery as well as my charity interests. We are the premier family-owned wine business in Washington State. Now our daughter Elise handles the marketing tasks, and our daughter Megan is an assistant winemaker. They are both new to having titled positions in the business, though they both grew up in and around it. Now it’s time for trial by fire and they are both doing well as they learn their individual crafts. What is your vision for the future of Barnard Griffin Winery? As a family business it’s our hope that our daughters and the rest of our family of employees will learn and grow within their positions and responsibilities and take the winery through and beyond the next stage of growth in further expansion outside of the Pacific Northwest. We have just completed helping set the stage for the next level with a brand new winery renovation. We have improved and enhanced our winery property on Tulip Lane in Richland. We have a new Tasting Room, weâ€™ve added a new room that is our Wine Bar, weâ€™ve expanded to add a new Private Event Space, and we now have a large Patio space that can handle special events as well. We also changed the exterior of the building and landscaping with a beautiful rock entrance sign that features backlit fused glass art that I created in my studio. The studio, too, has all new construction within the winery property with a new studio Gallery space incorporated into the Tasting Room. Itâ€™s modern, itâ€™s contemporary, itâ€™s spacious, and itâ€™s beautiful! Canâ€™t wait for everyone to come out and see the new space. Itâ€™s been a labor of love. Feel free to share any other thoughts that you believe would be of interest to our readers. Itâ€™s been fun and gratifying to follow artisan pursuits in both making wine and in making glass art. 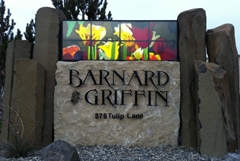 Barnard Griffin is the only winery in the United States that contains a glass studio producing artisan works of fused glass. My glass works are on display and available for sale in the Tasting Room. My journey with glass began in college with stained glass. Then in 2004, I had the opportunity to return to glass only this time using heat, kilns and torches. After taking classes at Bullseye Glass Company in Portland, Oregon, I continued to define my techniques from beads to fused glass and into architectural elements. I opened my warm glass studio, â€œdb Studio,â€ at the winery in the Fall of 2007 and became a Bullseye Resource Center selling Bullseye sheet glass in Fall 2008. I get to teach classes in warm glass at my studio in the winery, which is great fun. The primary focus of my work in glass has its roots in many years of sewing and a love of textiles. I enjoy blending unexpected color combinations of glass and working with nature themes. To enhance my artwork, I often include glass elements I have made in a torch flame. Some of my work has explored the reactive qualities of metal elements contained in glass. Precious metal components have been added to reactive glass for special effects in my work of late 2009 and early 2010. Also during this time, I used several different types of glass including powders and vitrigraph to â€œpaintâ€ images onto glass. Special depth effects are achieved by firing separate layers in the kiln and then continuing to fire a second or even third time. Some of my current popular motifs include wine glasses with red wine and petals either expressed as a flower or individually. At this point, the work centers on utilitarian items such as trays, bowls, and plates. I had the opportunity to create glass pieces for our recent remodel and these are both mobiles and stationery installations hanging from the ceiling in the new Wine Bar. My previous architectural/artist installations include our huge Rock and Glass entrance sign, the glass art embedded on the floor of our Gazebo, and a series of glass art panels on display on the main floor of the Tri-Cities Business & Visitors Center in Kennewick. Many thanks to Deborah for sharing her story and thoughts with us. I wish her, Rob, and their family all the best and will continue to follow their work and Barnard Griffin Winery with great interest, and I hope that you will too. For more information about db Studio and Deborahâ€™s glass art, visit the db Studio blog and web pages.